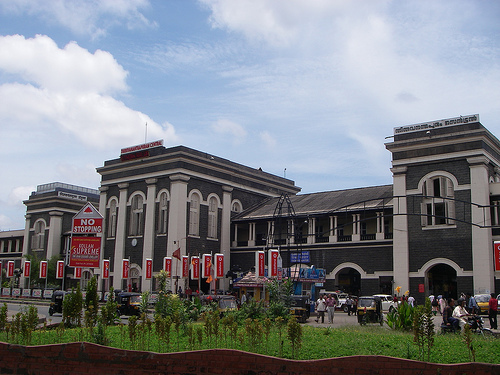 Trivandrum Central is the main railway station in Thiruvananthapuram city. It is the largest and busiest railway stations in Kerala, in terms of passenger movement and an important railway hub in Southern Indian Railway. Also, Trivandrum Central is considered as one of the profitable stations under Southern Railway. The railway station is located opposite to Central Bus Terminal at Thampanoor. TaxiTel provides railway station taxi Trivandrum services that will fulfill customer needs without any delay or compromise. Our experienced drivers who also drive wedding cars in Kerala are highly knowledgeable when it comes to road routes in Trivandrum and they can drop you to your destination even in peak traffic hours without any delay. TaxiTel – a foremost Trivandrum railway station taxi services offers an extensive variety of travel services plus Transfers. Our transport service in Trivandrum attends to your transfer from Trivandrum to your specific close by destinations which may be a city/town, pilgrimage site, tourist spot, etc. Our transport service as well comprises of Airport services at the most excellent and sensible rates. You can benefit from our Airport transport service to the airport straight from or to your hotels, railway station, bus stand, etc. We at TaxiTel have determined for ourselves a criterion for providing an enhanced and relaxed call taxi in Trivandrum as well as cars for NRI Keralites services to our esteemed customers. Railway station taxi services in Trivandrum of TaxiTel guarantees the customers’ enjoyable journey from their places in the city to their specific close by destinations. Together with this one direction means of transport, you can as well pick return transports service where you will be permitted to get extra concession on car/cab/taxi hire charge. Our transport services in Trivandrum intent to offer enhanced, smooth, protected and comfortable service to our customers. We provide you with a very extensive range of cars like non-Ac cars, budget cars, Luxurious cars, Ac cars, etc. We also provide services and cars for hire like wedding cars in Trivandrum, marriage cars in Trivandrum, luxury cars on rent, luxury cars in Kerala, call taxi in Trivandrum and best taxi service in Trivandrum. You can book a taxi to any railway station in Thiruvananthapuram district. Our railway station taxi service is way cheaper than the prepaid taxi service provided by Trivandrum Central railway station. You can book now and pay later for Railway Station taxi, and no online payment is needed for Thampanoor Railway station taxis in Trivandrum. TaxiTel offers pickup in addition to dropping reservations for Trivandrum railway station taxi in one booking. We have different types of vehicles that include sedans, SUVs, AC cabs, Non-AC cabs, as well as tempo travelers for your travel to and from Thampanoor Railway station. TaxiTel’s trusted taxi service can be used to plan your ride that will be perfectly suited for your Trivandrum train timings. We have delivered more than 5000 taxi rides and we continue to deliver customer-specific and affordable services anytime anywhere. We make available a variety of Kerala family tour packages as well. You can without difficulty rent a car Trivandrum based on your requirement. With TaxiTel, you can be assured of an unmatched customer service and clear fares when you reserve marriage cars in Kerala, airport taxi in Trivandrum or even luxury cars for weddings. TaxiTel is a travel agency Trivandrum company that offers praiseworthy 24 hours taxi in Trivandrum services. TaxiTel wedding cars and tempo traveller hire in Trivandrum have broader functions in and around Kerala. Many sorts of cars are accessible with TaxiTel to set up the contemporary and rising cab demands of the customers. TaxiTel as well has helpful cab supervising systems plus strategies to maintain the accessibility issues of the taxis high demands, especially during peak times. We as well provide our customers with taxi Trivandrum, taxi Kerala as well as Sabarimala taxi by keeping in mind their comforts and safety. Taxitel also provides hotel reservations, local assistance, a driver on call, and round the clock travel. You can contact us via mobile (+91 9947019292, 9947029292, 9847019292), or you can email us (taxitel@gmail.com) for knowing more about our services.